They’re in New Hampshire now. Fitting, from a personal viewpoint, because that’s where the whole Barack Obama thing started for me. Not with the inspiring speech at the 2004 Democratic convention, but in New Hampshire, a year ago. Donna and I were catching the news one evening last winter, well before anyone had declared for the presidency. During the course of the broadcast, we both had an epiphany. Or at least a political epiphany. We saw this confident young man addressing a group of people on a snowy night. The man, Barack Obama, was black. The group he was speaking to was all white, very large, and wildly enthusiastic. I said to Donna, “There’s something going on here. I don’t think I’ve ever seen anything else like it, and I can remember some charismatic politicians in my time.” Among them are FDR (yes, I’m that old), JFK, Adlai Stevenson (a two-time loser, but a charismatic speaker), and Colin Powell (whom I witnessed having CEOs and factory workers eat out of his hands; but then he declined the call). The "something" that was going on in New Hampshire in early 2007 had nothing to do with his policy on this issue or that, or his votes in the Senate, or anything as specific as that. Rather, the “something going on,” at least in our view, was that this could be a candidate who could unify this unbelievably polarized country (just as I thought that Colin Powell, a Republican, might have done). Neither of us had ever been involved politically at the national level, but there’s always a first time. (Well, when I was 19 and at college, I campaigned for Adlai, but that hardly counts.) We then read Obama's books, we did some further research, and we soon got in touch with the Obama exploratory committee and said we’d like to raise money for him – even though he had not yet declared. Out came our tin cup. We solicited friends, friends of friends, close relatives, distant relatives, casual acquaintances, and any warm bodies who would take our phone calls or keep our e-mails from going into their spam box. We learned in the process that many of our friends were behind Hillary, that a lot were Republicans, some were Biden fans, a few supported Richardson, and a lot were simply unwilling to commit to anyone that early. We probably wore out some of our friendships during this exercise, but we were on a mission. When all was said and done, the response turned out to be remarkable. We were floored by how many people from how many different camps sent in their $2,300-per-person checks. By the end of the March quarter, the two of us had raised one-half percent of all the money that the Obama campaign had raised nationally. Part of the carrot that we used was to promise them an intimate meeting with the senator at our apartment. On the evening of May 3, about 50-plus of them showed up on Central Park West for our “intimate” reception. As it turned out, the event actually was reasonably intimate. The senator generously pressed the flesh with everyone either before or after his talk. He posed for pictures, he signed copies of his first book (Dreams from My Father – a wonderful insight into the person), and only the insistence of his handlers got him to finally leave. 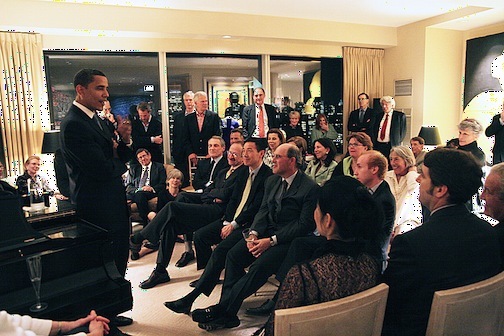 One impression of of Obama that evening sticks in my mind. Observing him in action mingling with the crowd stands in contrast to my one meeting with a Clinton (Bill). Now both Obama and Clinton are masters at this game, but with one significant difference. I've met only one Clinton (Bill), and just once. But I spent four hours in a Metropolitan Opera box with him (and six others) in early 2001, just after he had left office. There was, of course, a lot of chitchat before, during and after the performance (Aida). And herein is the difference. At the opera, Bill (“the smartest person in any group”) lectured. 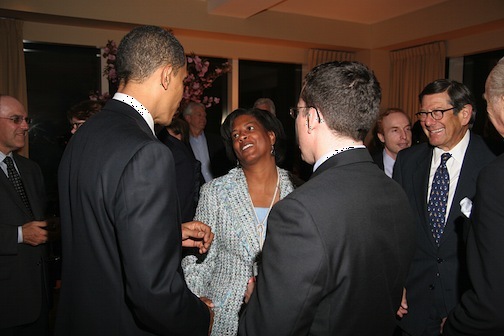 At our fund-raiser, Barack (no intellectual slouch himself) listened. In his campaign, Barack says the election is not about me, it's about you. I believe him. On January 8, the New Hampshire voters will cast their ballots. Forty-five percent are registered independent. In Iowa, Obama dominated the independent vote. So even though the chart of the polls compiled by Real Clear Politics shows a tight race between Obama (rising green line) and Hillary (declining purple line), the trend is definitely toward Obama, before and after Iowa. But the chart above shows the average of many polls, some of them not yet reflecting the Iowa results. 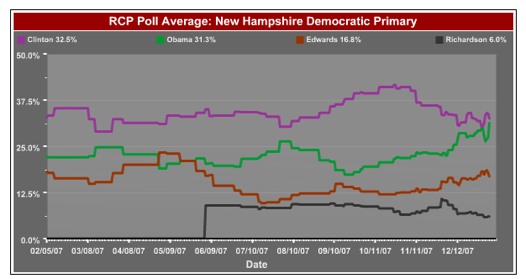 The most recent poll, from American Research Group, has data through today (Jan. 5), and shows Obama with a 12-point lead over Clinton and 18-point lead over Edwards -- significant changes just in the last few days. My favorite observation on the Iowa results comes from former Bill Clinton campaign staffer Paul Begala, who appeared last night on Charlie Rose. Begala quoted some Democratic operative as saying that Hillary's loss may have been a blessing in disguise. As Begala reminded us, Churchill had this rejoinder when his wife Clementine proffered that phrase after his defeat in 1945: "It may well be a blessing in disguise. At the moment, it seems quite effectively disguised." On to New Hampshire. A year later. 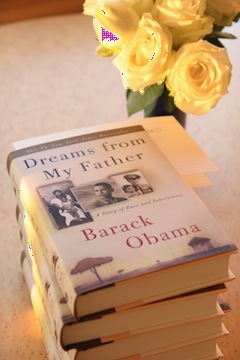 Signing "Dreams from My Father"